My UFO for this month was finished earlier this month. It is a pattern by Bonnie Hunter. 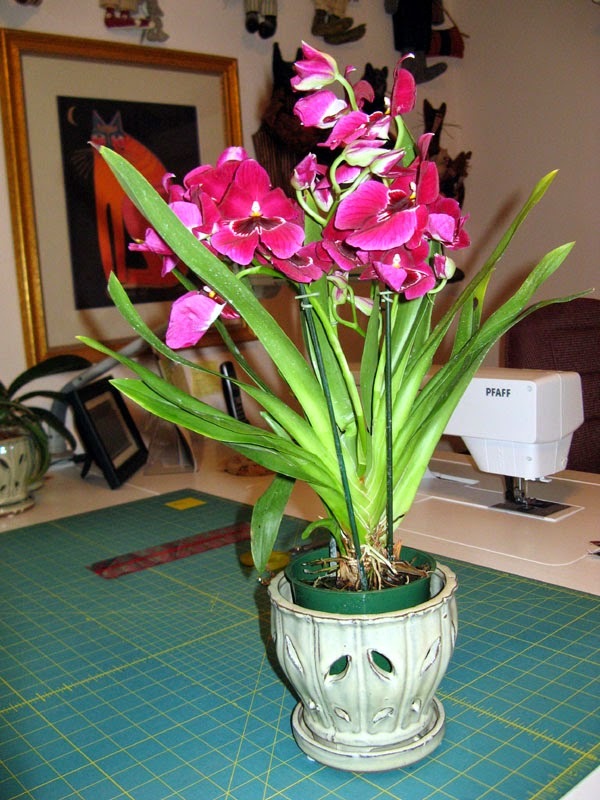 It is available FREE on her website if you are interested in making it. I made mine with leftover HSTs. 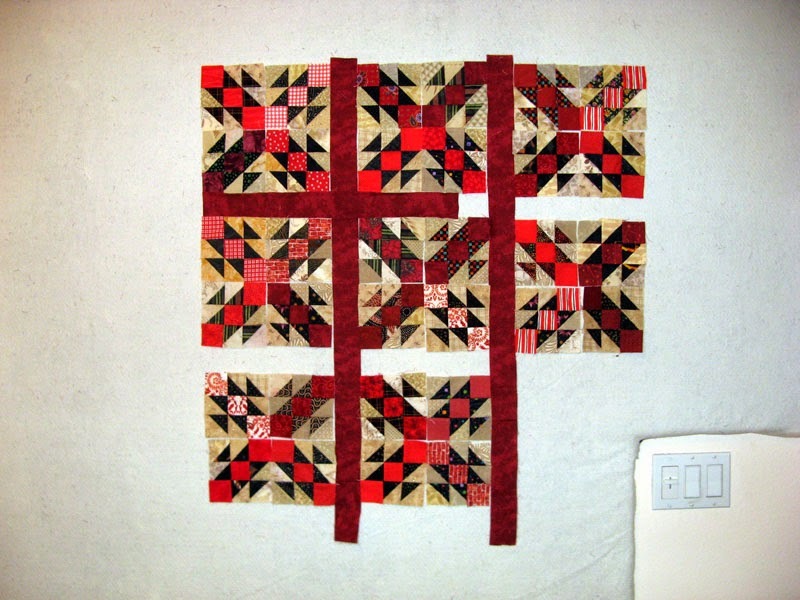 I only needed to cut new the solid red squares, inner and outer borders. I was lucky with this one being able to use every bit (even the batting) from my stash. Mine is smaller than what Bonnie's pattern called out. 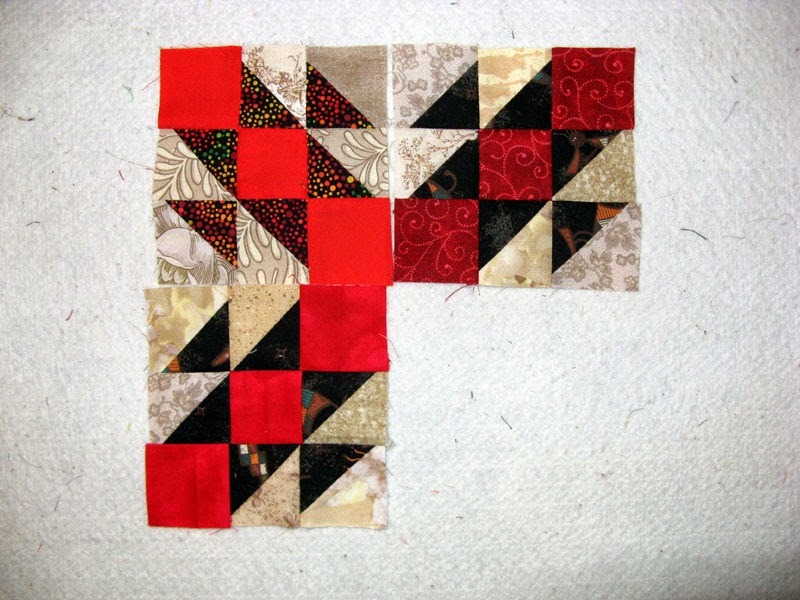 The pattern suggests 2 1/2" squares and HST units, but I used 2" instead. It looks like Kerry from Kerry's Quilting will have Kings for me when I get back from my vacation. 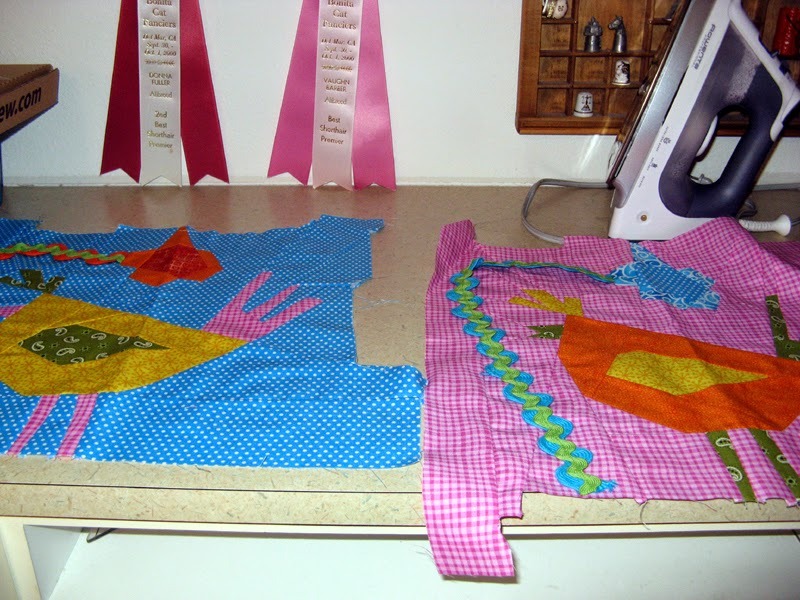 Kerry is working to have all of the Bonnie Hunter quilts quilted for when Bonnie comes to our area in early October. (Those who follow Bonnie's schedule know that there is always a load of her projects to show her from all her admirers.) 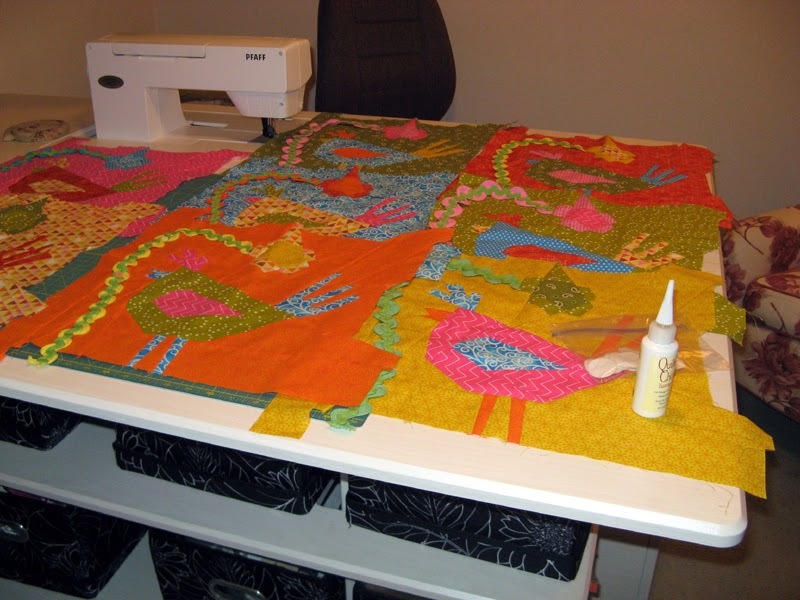 Kerry has two of mine Kings and Kootenay Kabins and several of her own yet to quilt. I also have a UFO in the queue for 2014 that is a Bonnie Hunter design called Fourth of July! (I'm going to call mine Kadence). Just maybe it will be September's UFO giving Kerry yet another... Boy am I keeping her longarm busy! 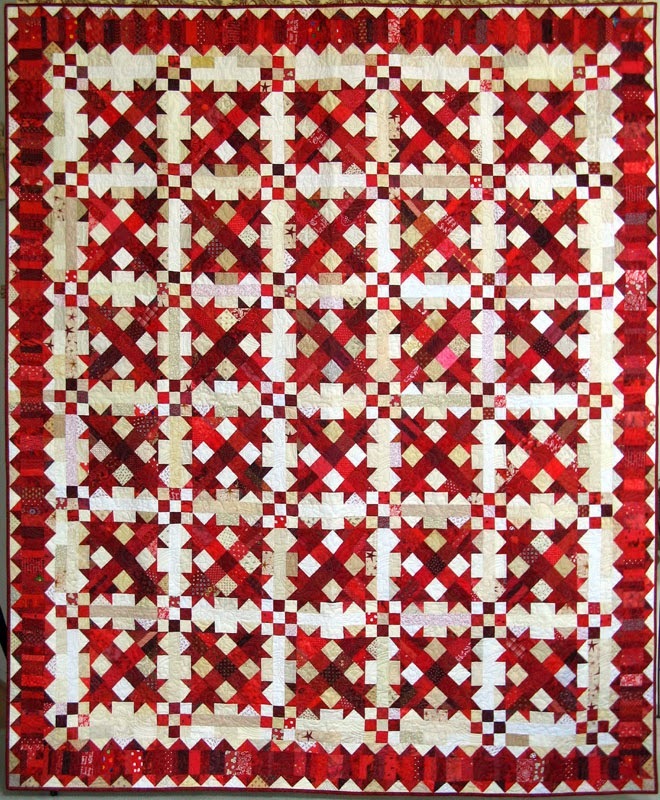 Hope you stop by 52Quilts and see more of the Twelve in 2014 on September 1st. Aunt Marti can really put on a wonderful parade of quilts. Not much sewing going on in my studio this week. 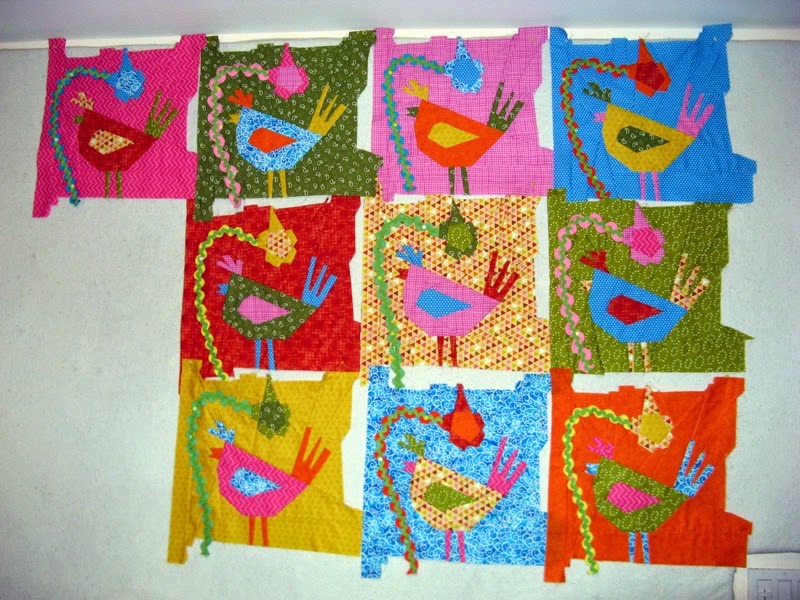 I still have just ten birds sewn. I want to have a long period of time ahead of me to sew the next ten before I begin removing pins and shuffling fabrics. These ten are part of my travel sewing. I have the eyes prepared for perle cotton stitching. I spent time yesterday with Kerry. Decisions have been made on all the quilting designs for Krossfire so no obstacles in the way to having it done in time for turn in day. Since I'm leaving on Thursday Kerry has graciously agreed to stitching down the binding, sleeve, and label. There just won't be enough time for me to do it. Can't wait to see it all finished, but that won't be until after the show. I don't return home until the day after the show concludes. I have a busy three days ahead of me! It is a splendid weekend in San Diego. The weather has just been wonderful; not too hot for our near the coast home and cool enough for great sleeping. I'll admit I stayed in bed a little longer this morning... Nice! I've been getting ready for my visit to Maryland. The two small projects above need perle cotton stitching that I'll do on the long plane ride East. 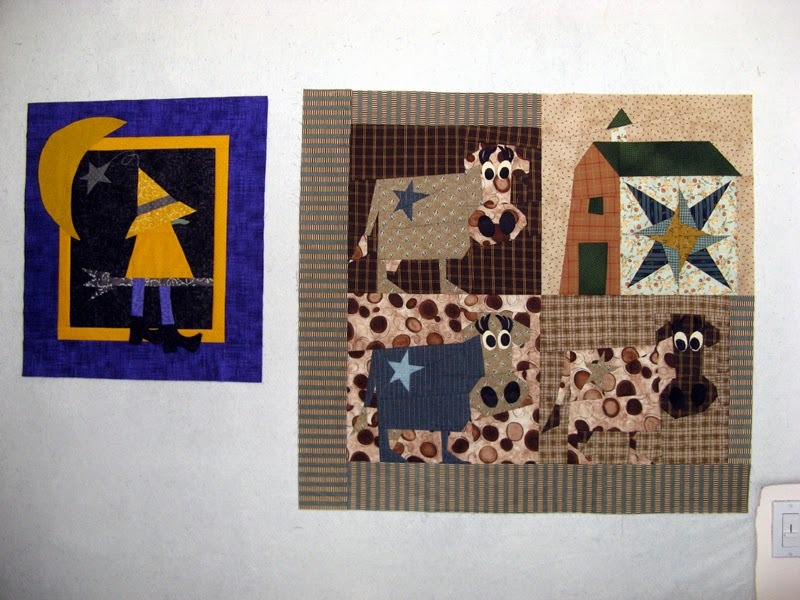 The blocks are Buggy Barn designs leftover from their main projects (If The Hat Fits and Til' The Cows Come Home) that have been stashed away for a little while. The perle cotton stitching will be on the moon and a motion swirl from the tip of the witch's hat to the star along with the lashes, pupils, and nostrils of the cows. 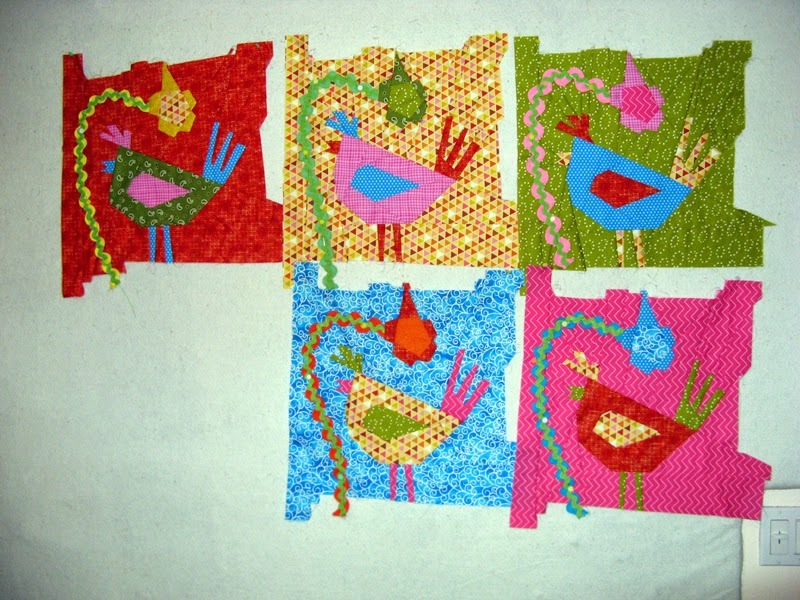 I also plan to stitch the eyes of the birds from my current Bird Brain project. 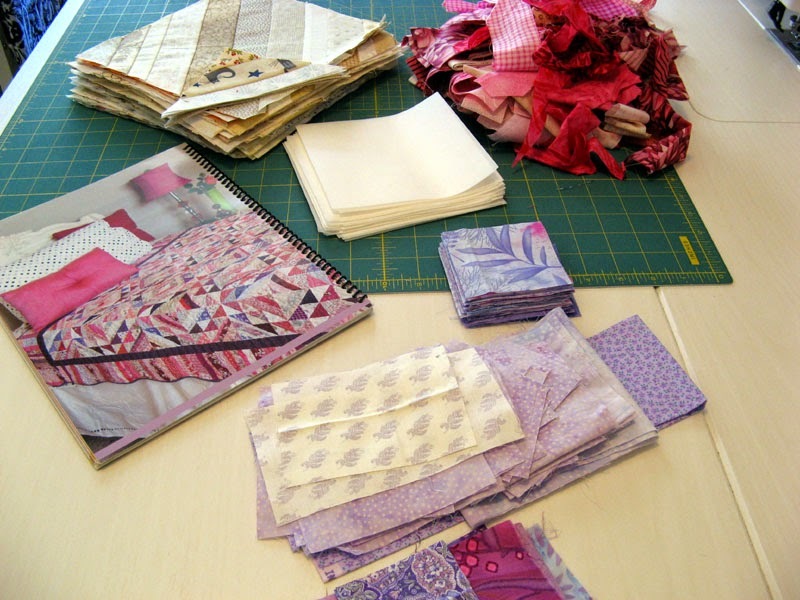 I haven't spent much time except cutting the second stack of fabrics for my Bird Brain project. I have been tackling my rug instead. The top rows are the correct way to weave this project. 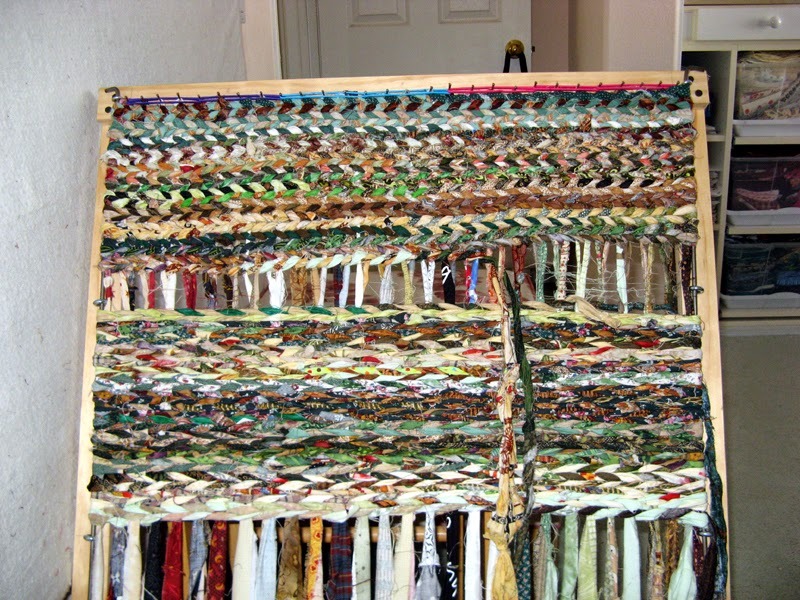 You may recall that Tiffany started weaving for her first time in July when she visited. She got pretty far along and I picked up from where she left off. Got to the midway point before realizing that the weaving was wrong. :(! So as I weave the right way I'm pulling out the wrong. The bottom rows all need to come out. Thankfully I can use what is being removed. Can you see the difference in the weave? Nothing has changed either way with my stash. Frankly I don't see that happening too much in the next couple of weeks unless my September UFO needs something. Enjoy your week ahead. And then there were 10! 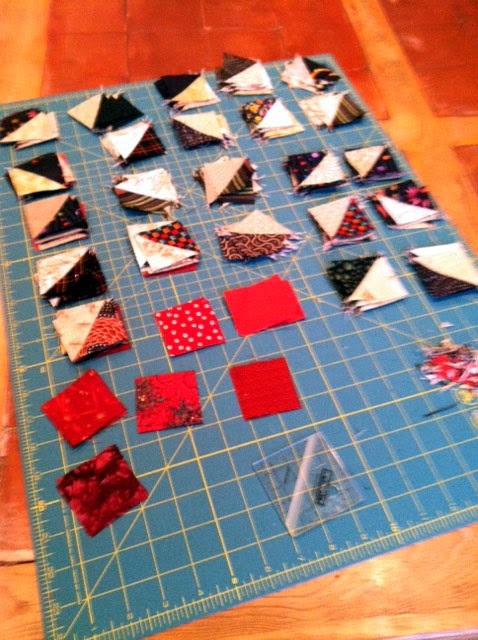 Half of the Krazy Kookoos blocks are done. There will be four of each color. Blue, green, yellow, orange and pink. 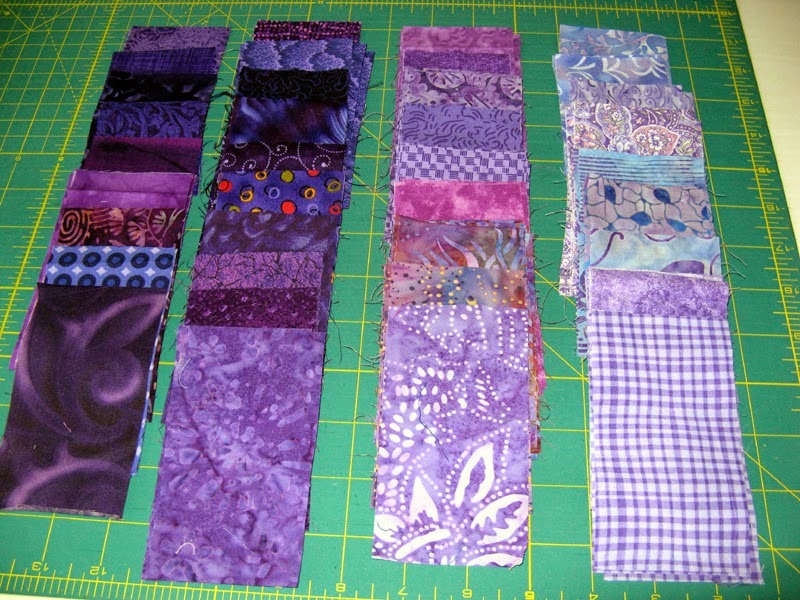 After finishing these I readied the next ten fabrics in their specific order. Ironed down the freezer paper cutting pattern and cut out each piece. My pizza box is full again and ready for the next birdies to be sewn. I continued working on Krazy Kookoos yesterday. There are nearly ten completed with another ten to go. The top five are ready for squaring up. That will come as a last step in the process since I'll need to get them all to the smallest size block from all 20 that are to be made. The bottom five are just two long seams from going to the wall! All though 20 are to be sewn only 17 will make it to the quilt. More on this too cute Buggy Barn design called Bird Brain in the coming days. Oh by the way Buggy Barn designs are not paper pieced. They are all cut pieces assembled together. This design is a bit challenging I will admit. 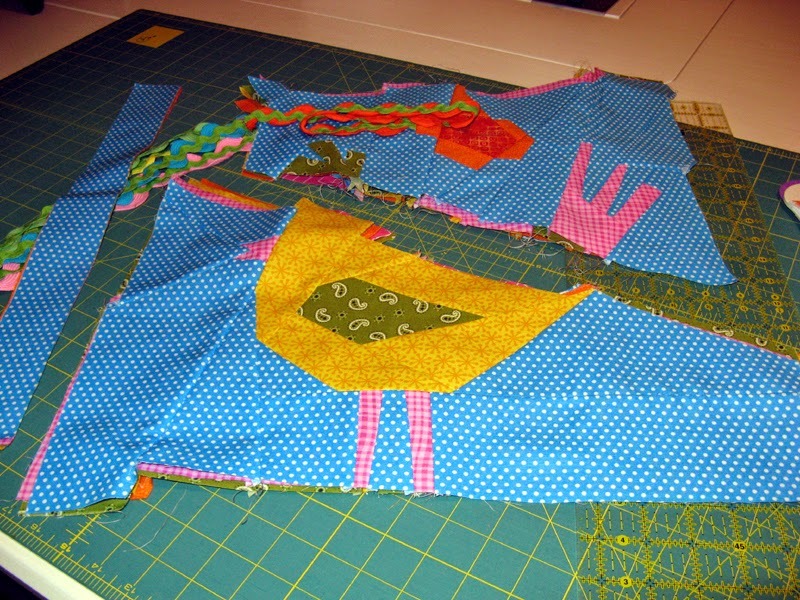 Lots and lots of pieces come together to make these birdies! A visit to Rosie's Calico Cupboard on Friday enhanced my stash by 4 yards. 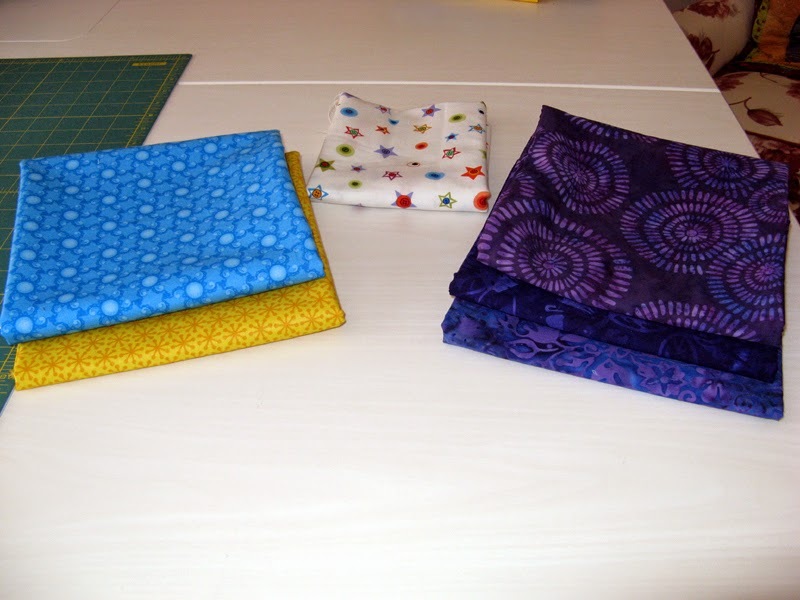 The two fabrics on the left will be used for Krazy Kookoos. 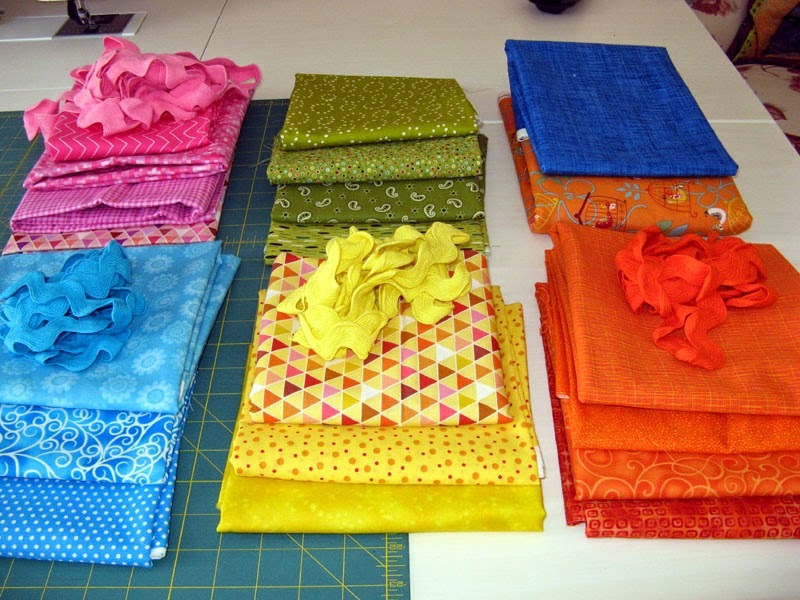 As a matter of fact the yellow is in the stack of fabrics ready to assemble into "Kookoos"! One of the three purples will be used for Krossfire. 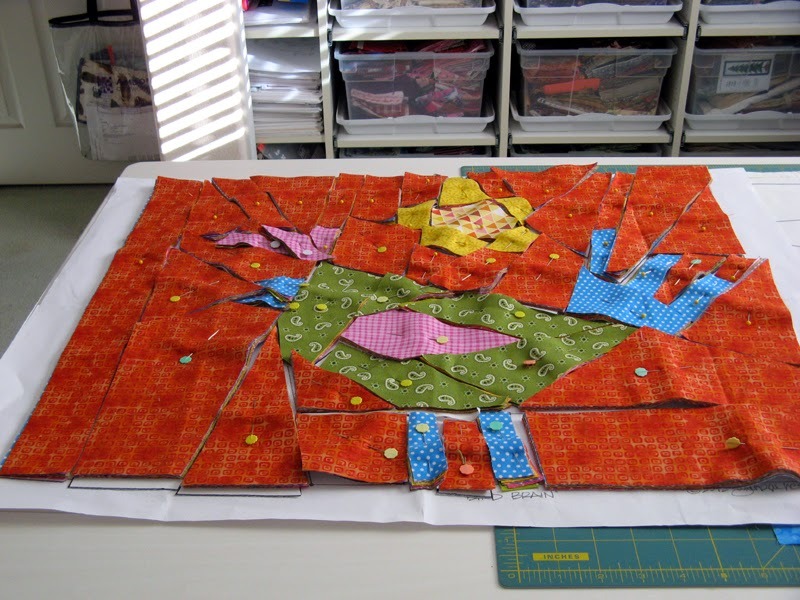 I didn't have the quilt with me, only a few of the fabrics, that I used get a piece large enough to go around. 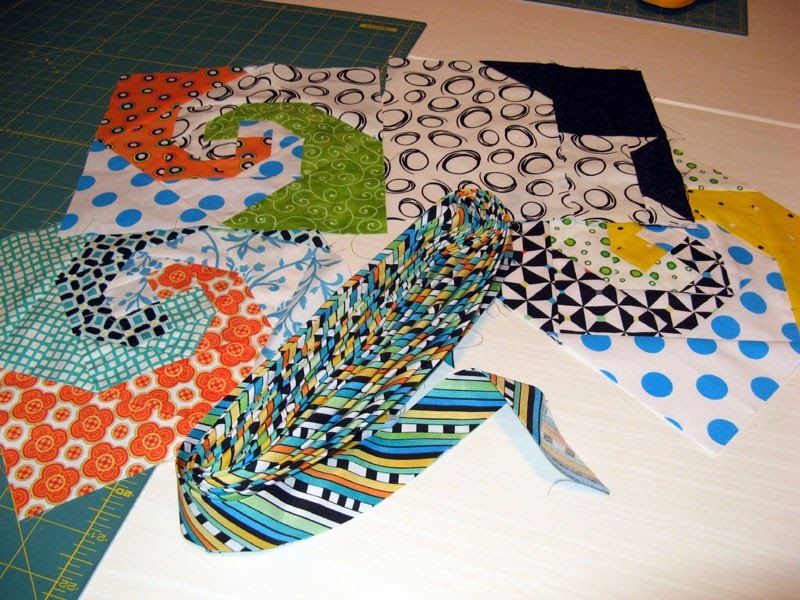 Kerry's Quilting has it...can't wait to see how it comes out. Time is running short so I need to be ready when Kerry finishes. The FQ in the center is being used for the Midnight Flight Swap and Zuckerwatte. So once again my stash was enhanced with nothing to counter balance. Looks like I'll be enhancing and using same pretty much this year. The stash can only handle scrappy projects! I'm sharing my selection so far of dark blues and the various purples that I plan for Kamikaze my Midnight Flight project. 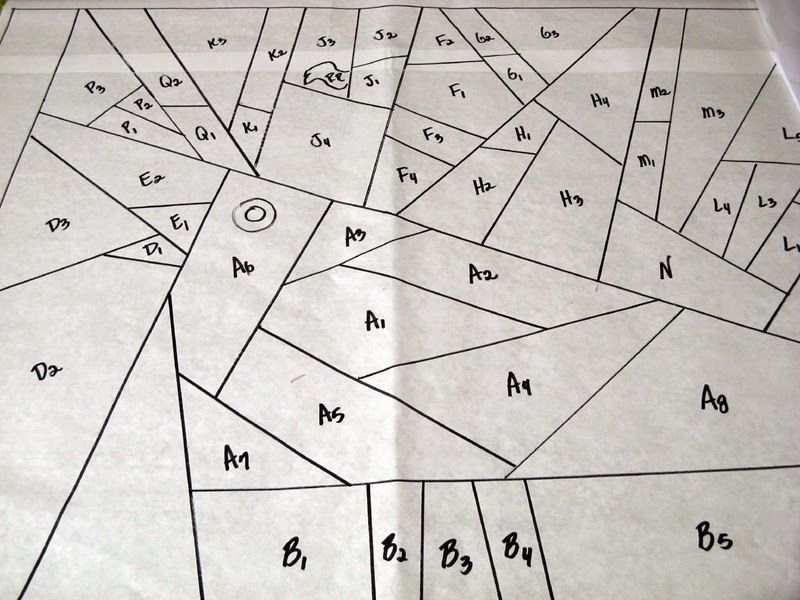 I hope this helps select the fabrics you will use to assemble your Star Blade units for the swap. After washing bed sheets, cleaning up the breakfast dishes, combing Koko, sewing down the sleeve and photographing Krackerjack I am heading off to Rosie's Calico Cupboard and Quilted Rose for fabric and thread. When I get back home I will be gathering everything needed for the Buggy Barn workshop on tomorrow. I am so looking forward to creating some crazy birds from the Bird Brain design. I'll share my progress on Krazy Kookoos after the class. I've finished entirely Kranberries. Think it came out really nice. The quilt was so big I had to take out my quilt rack to get a complete picture. Fun project that used units from a block swap that I coordinated recently. There were about 18 of us that swapped Red Strings and the Nine-Patches. If you look close enough you'll notice both units. Someone used a pink square in one of their Nine-Patches. I had to include it just for something to talk about! 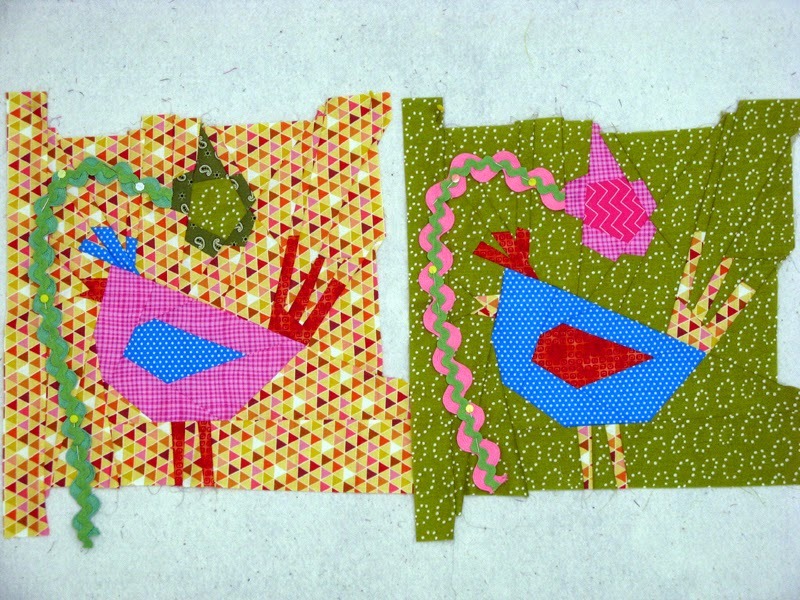 Saturday I will be taking a workshop with Julanne Bergstrom to make the Bird Brain design from Buggy Barn. Those who follow my blog know how much I have come to like Buggy Barn designs. I have one more blue and one more yellow to find yet. Notice I'm in need of names for this and the next two projects =^.^=! Bonnie Hunter designs really keep me involved and use up lots of my stash. Midnight Flight comes from her latest book More Adventures with Leaders and Enders. This is the swap I am just starting with about 16 others. The swap is to make the Star Blade Units. Just love the variety that comes with swaps. Zuckerwatte will allow me a first time ever scalloped border. I once did applied and did the binding for someone on their scalloped border, but never did one of my own. I will be using units from another swap I coordinated that was neutral string blocks. I am getting ready to visit my parents and this will be one of the projects I take with me to work on. I have pink string blocks to make, 40 of them that will be 5". Mom has been setting aside her extra pinks. I am busy working on Krackerjack this week. I have hand sewing to do. 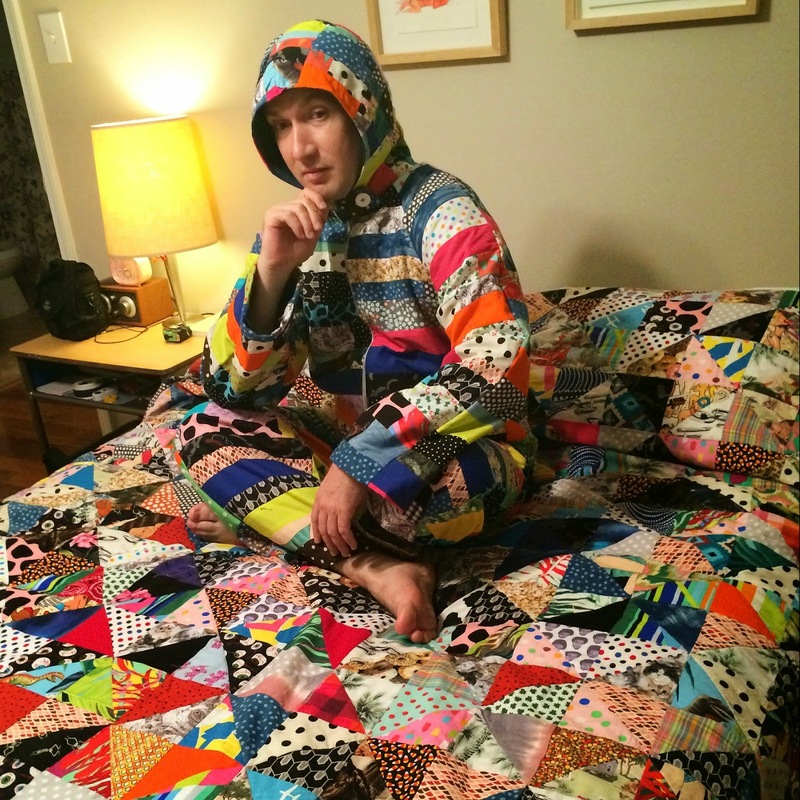 This quilt is AWESOME! I had a time auditioning possibilities for the binding. I looked at six different fabrics and finally settled on this one. Black and whites always play well with one another. There are many more projects to look at today through the links at Patchwork Times. Enjoy!! 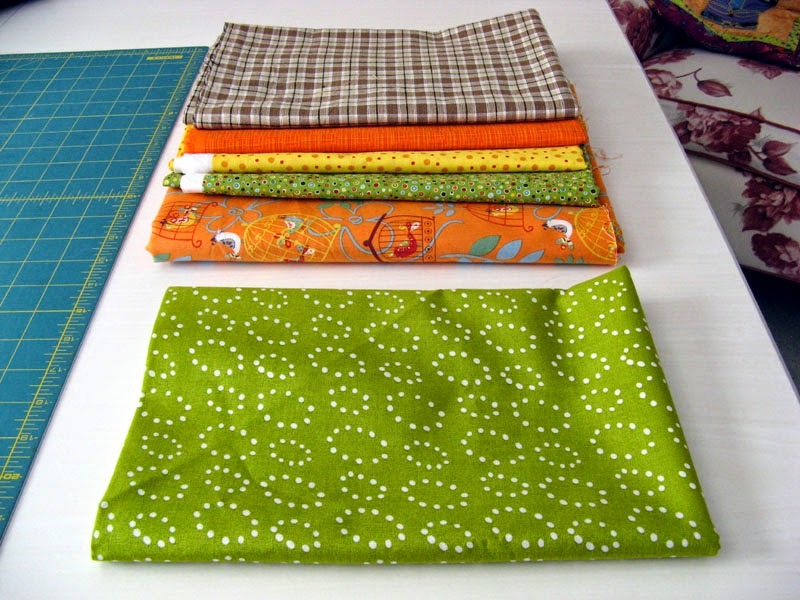 This week I've been busy purchasing fabrics for my Buggy Barn workshop that is on Saturday at Paradise Sewing. Of course I started in my stash...but I don't happen to have too many 3/4 yard pieces and I needed a bunch for the cute Bird Brain design that we will be making. All of the fabrics except the brown plaid will be used for the project. I still need one more blue to go with the grouping in the top left and one more yellow to go with the yellow group. The darker blue will be used for the sashing and the orange print you see below will be for the back. These fabrics came from three different places, next stop Rosie's! The brown plaid will be the binding for my Kootenay Kabins that is in Kerry's quilting queue. I did finish Kings during the week. I managed to pull all of the fabrics from my stash. It isn't a very large quilt hence not much yardage to offset all my purchases this week... I'm bringing in almost as much as I'm using. I need to get that stash working better for my projects! How are you managing your stash? 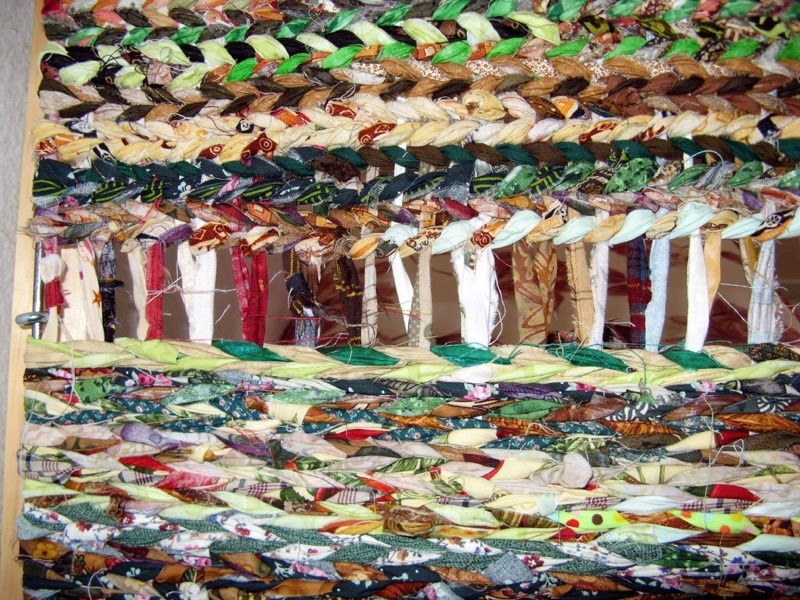 See others through the links at Patchwork Times. Have a splendid week. 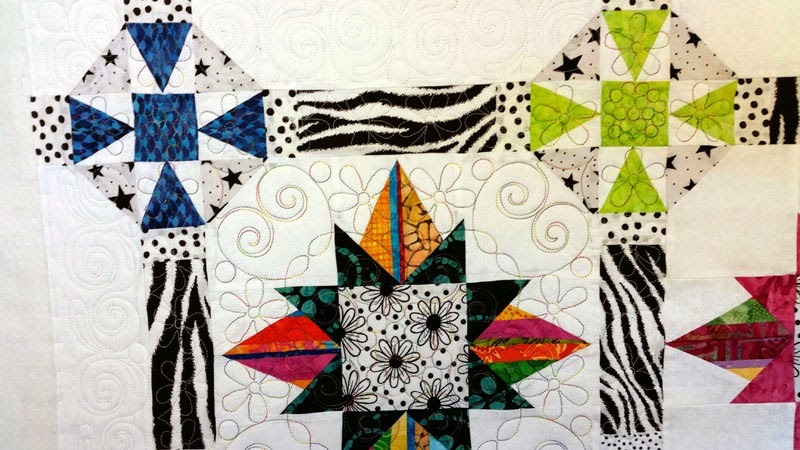 I'm very excited about the quilting going on at Kerry's Quilting! This is Krackerjack just getting started...progress as of Wednesday... Kerry is thinking it may be done for me to take home tomorrow. If so I'll be binding and sleeving and labeling this weekend for certain. This one goes into the San Diego Quilt Show with a turn in date looming. Hope your Friday marks the end of your work week! My UFO is complete for this month. I have a workshop next weekend and vacation the end of the month. Having this project done is a good thing! 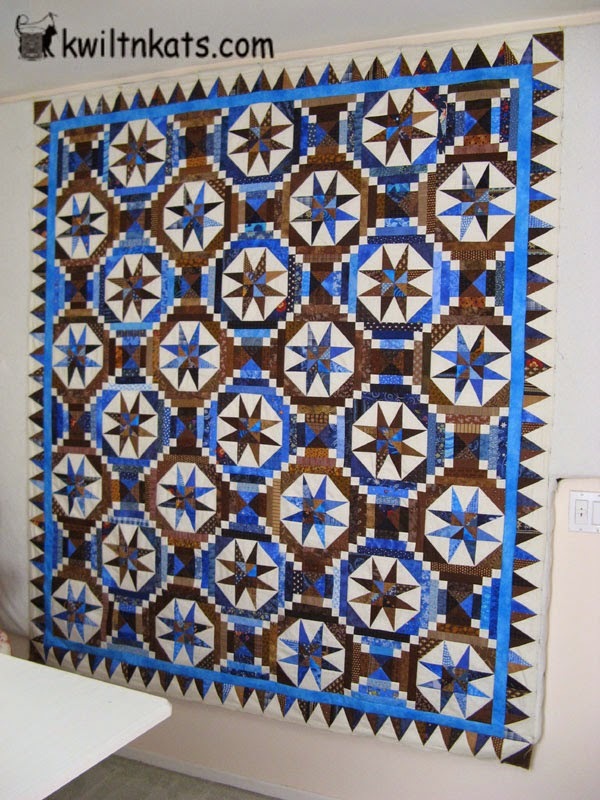 Bonnie Hunter designed this quilt which she calls Playing with Jacks. Mine is certainly quite a bit smaller. 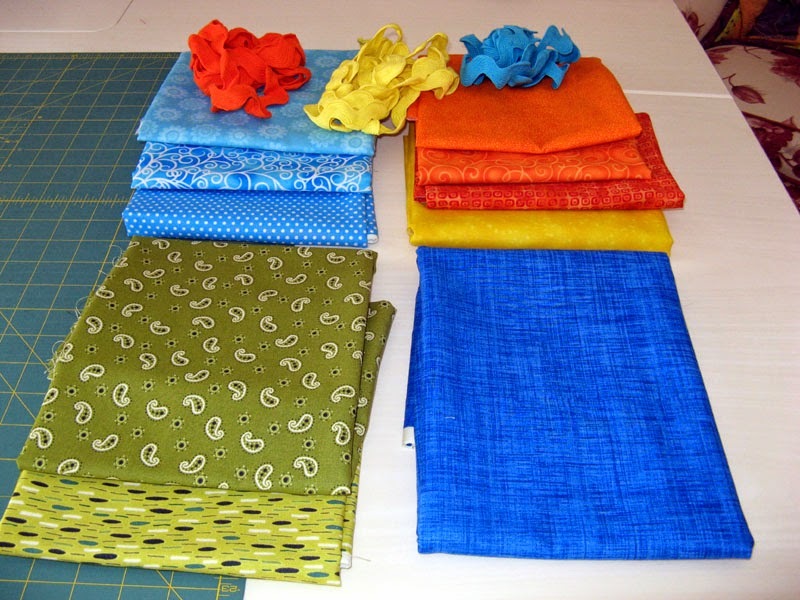 All fabrics are from my stash too right down to the bonus HSTs that were already assembled from a previous project. I was in pieces with Kings (my August UFO) on Saturday evening. Now I'm on the design wall! I think I'll stay small with this project. 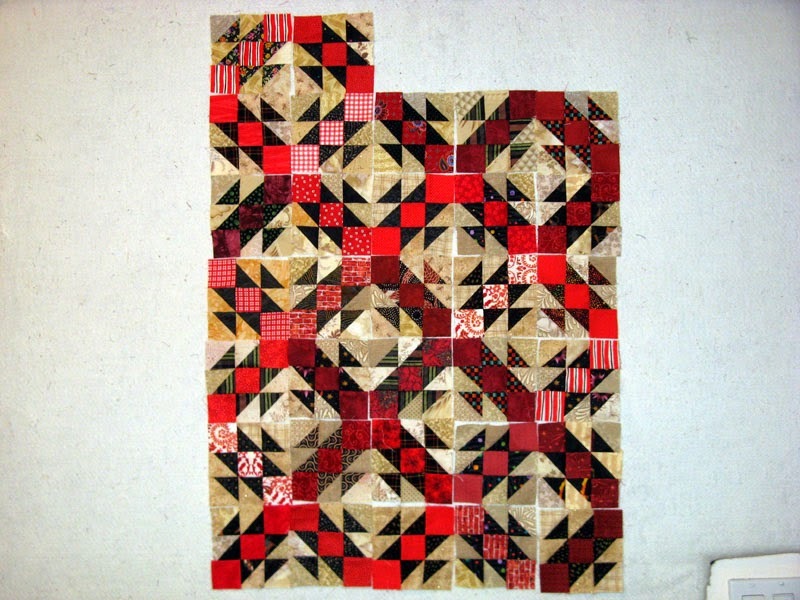 I used bonus triangles from a quilt that I finished a few years back. They are the neutral/black HSTs. Playing With Jacks is a Bonnie Hunter design that is FREE on her website. Her project suggests a 2 1/2" HST, but mine are 2" instead. There are several different suggested layouts. Above is her cover layout. Let's call it #1. This layout is more contemporary according to Bonnie. It is block to block in zig zag waves. Layout #2. This layout has four blocks rotted to form a star. 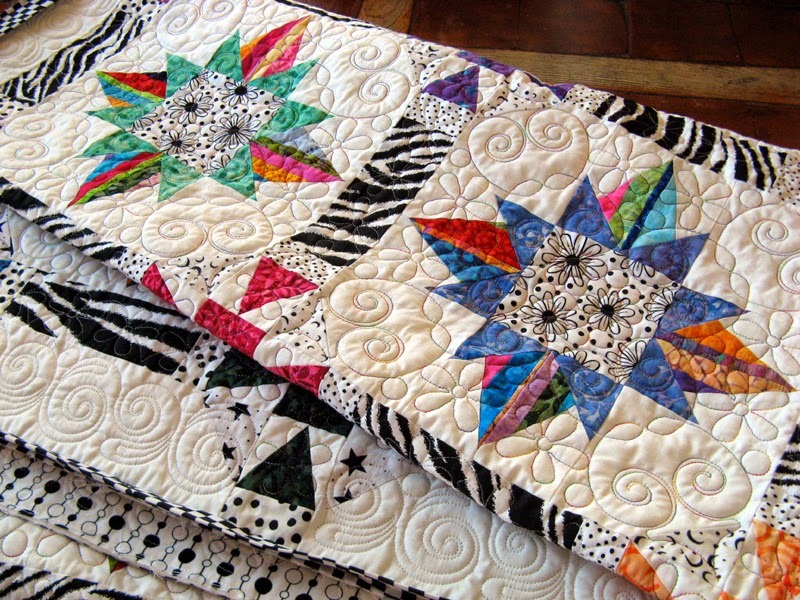 You add sashing and cornerstones (which aren't there in this photo) between each four-block star. I'd use a single black fabric for the cornerstones. You can also do this around single blocks. Let's call this layout #3). Do you have a particular favorite? More interesting projects to admire today through the links at Patchwork Times. This is indeed a bit over the top! Makes me laugh out loud...how about you? I had a good week with a finish and no purchases to boot. I finished off my July UFO, Kurly Kats, just in time, actually had a day to spare. 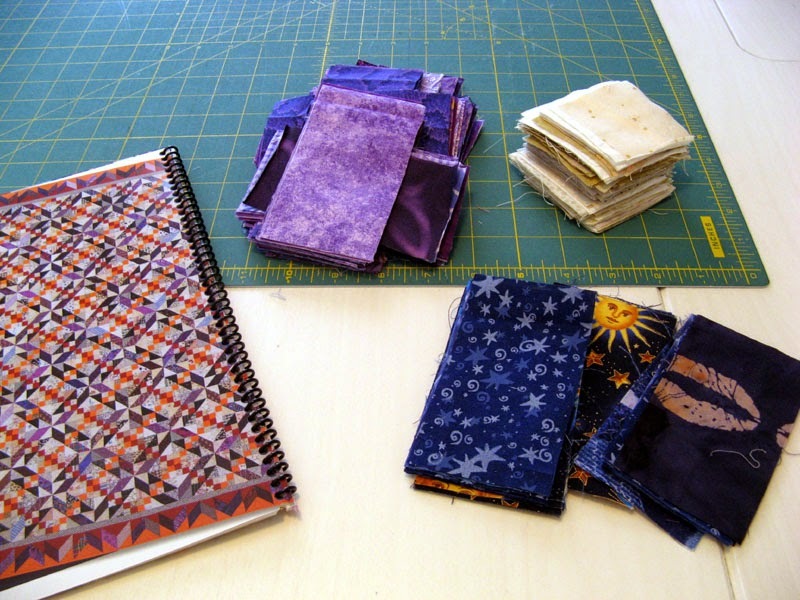 I took time to prepare the binding for it with leftover border fabric. 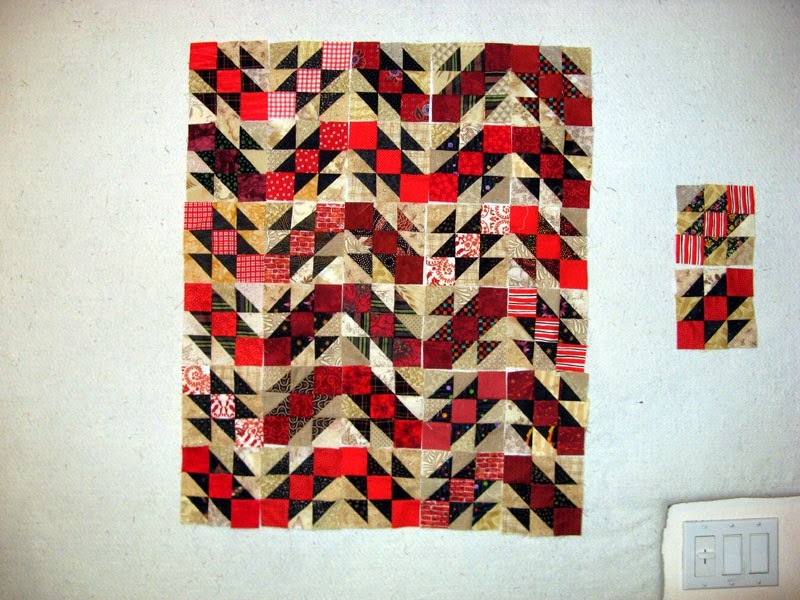 It will be a diagonal direction when it goes on the quilt. 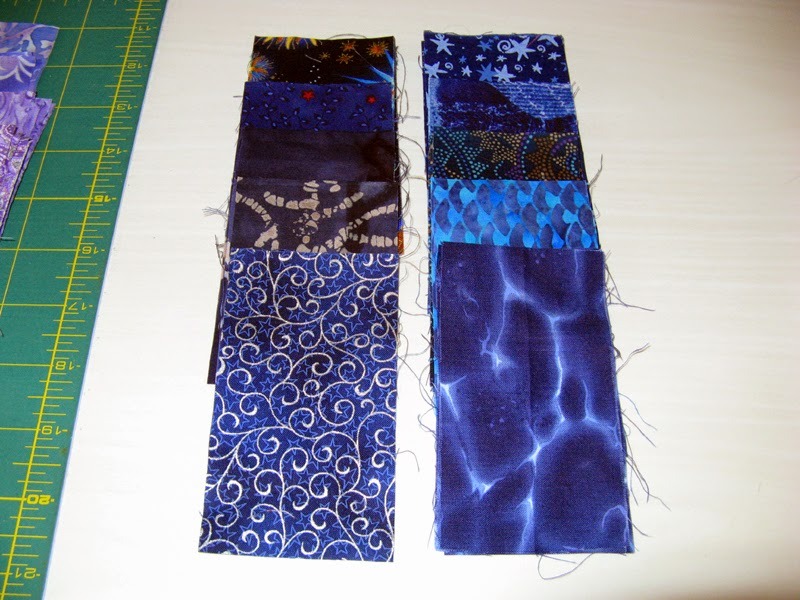 I also assembled the remaining snail's trail blocks that will become part of the sleeve. Kerry has it for quilting now. I decided on a quilting pattern that has dragonflies and hearts using black and white variegated thread. I'm just getting going on my August UFO. This one will be called Kings. It is a Bonnie Hunter design called Playing with Jacks. 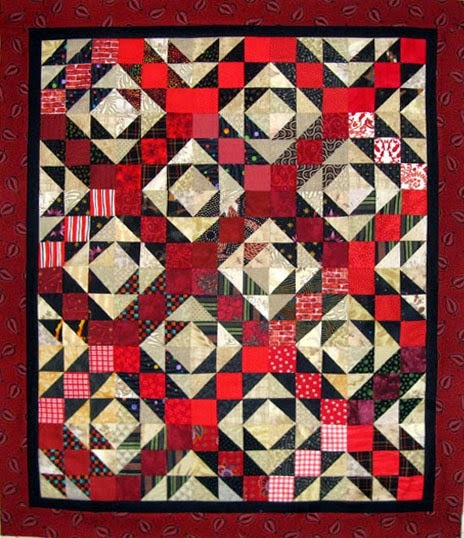 It is FREE on her quiltville.com website. I pulled all my bonus triangles that I could find blacks and neutral. Sorted them out into sets of six identical blacks. Next I took out my red strips that could produce three identical reds. Bonnie's directions call for 2 1/2" unfinished sizes, but mine will be 2". Trying to work with sizes I have already. Not much to show this morning, but the day has just begun! Here's my stash stats for this first week of August.